In 1942 Fred Stern (1895-1970) registered for the World War II draft when he declared that he was 49 years old, born 9 April 1895 in Hanover, Germany, and that he lived at 144-50 77th Ave., Kew Garden Hills, Queens, New York. He also declared that he was employed at Kopper's Chocolate Co., 18 Waverly Place, New York. He was, in fact, president of the company. 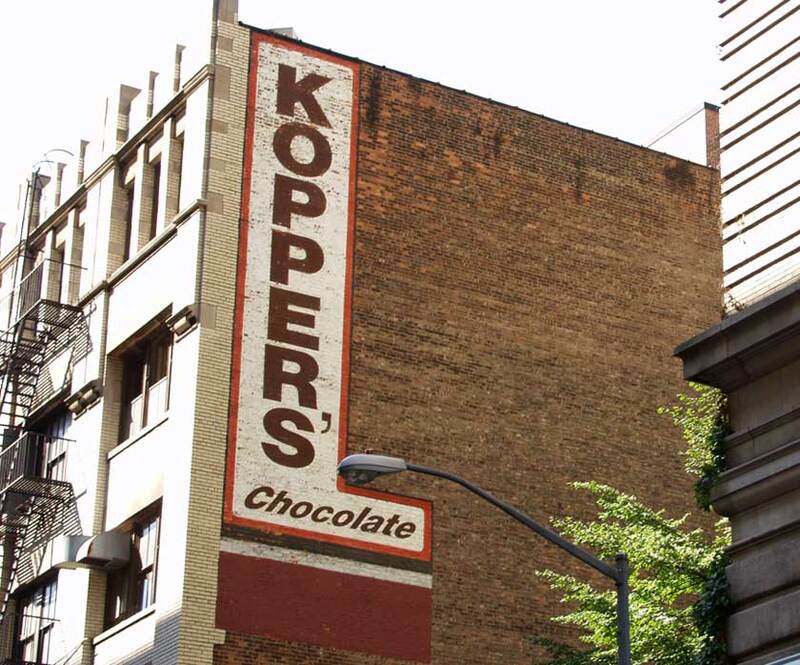 Kopper's Chocolate Specialty Co. was first listed in the New York telephone directory in 1938, when they were located at 225 Greene St. in Soho. In 1939 the address changed to 18 Waverly Place near Broadway, and they stayed there through 1985. In 1986 they moved to the building above, at 39 Clarkson St. in the West Village. As of 2012 Koppers is still in business in New York at this location. Their website http://www.kopperschocolate.com claims "Since 1937," but gives very little information on the history of the company. Numerous newspaper articles also write a great deal about the quality of the chocolate, but give only small fragments of historical background. A few of the history tidbits are: "The appetizing aroma of chocolate that is being melted pervades the factory of the Kopper Company at 18 Waverly Place, where candies in the European style are manufactured for sale in retail stores in many sections of the country. The confections, with which we first became acquainted at Altman's, are of twenty varieties that the firm used to make in Germany before its establishment in this country in 1938" (Jane Holt, New York Times, 8 May 1944). "THE FOOD CRITICS love Koppers chocolate-covered coffee beans, so I went to Koppers, at 39 Clarkson Street, particularly to recapture my childhood's delight. Leslye Alexander, representing the third generation of her family in the business, says that Koppers likes to do ''what is fun'' and that candy makers in general are cheerful people. All of Koppers candies - including Amaretto Cordials, Rainbow Raisins, French Mints, Creme de Menthe Cordials, Candy Coated Almonds and Punch Crunch - are made by ''panning'' inside a revolving drum. The resulting dragees are encased in plastic or sold loose, destined for the glass bins of candy shops where a clerk will scoop up a pound or two as ordered" (Betsy Wade, New York Times, 15 Nov. 1987). Fred Stern's death notice in the New York Times, 5 August 1970, read, "Stern - Fred, beloved husband of Else, devoted father of Lorie Alexander, loving grandfather. Services, Wed. 11 A.M., at Schwartz Brothers "Forest Park Chapels," Queens Blvd. and 76th Road, Forest Hills." More informative was his wife's notice, New York Times, 8 July 1999, "Stern - Elizabeth (Else). Wife of the late Fred Stern. Survived by her beloved daughter Lorie Alexander, grandchildren Leslye Alexander and Jeff Alexander, and great-grandchildren Rachel and Jonathan. Predeceased by her beloved son-in-law Harold Alexander and by her sister Stefanie Kudesh. Born 1903, in Bad Hamburg, Germany, Mrs. Stern's heroism in smuggling monies outside Germany to sponsors enabled members of her family to escape Nazi Germany. With her husband, she helped establish a premier chocolate company in the U. S., Koppers Chocolate. Her family will miss her keen intelligence, beauty, grace and dignity with which she carried herself through the 20th Century. Services private." People mentioned here still active in the business (as of Nov. 2012) are Stern's daughter, Lorie (who married Harold Ludwig Alexander (1923-1997)), and his grandchildren, Leslye Alexander and Jeff Alexander. foodspring.com has the following on Leslye Alexander, "Leslye Alexander’s grandfather, Fred Stern, a European chocolatier, founded Koppers Chocolate in 1937 in a factory in New York City’s Greenwich Village. Today, Alexander, her brother Jeff and their mother Lorie continue Stern's tradition of using the highest-quality ingredients, old-world sophistication and attention to detail when making more than 300 delicious chocolate varieties. They strive to incorporate the most modern innovation and technology, inspired by Alexander’s father, Harold, who created the first chocolate-covered espresso bean more than 35 years ago (the company now produces more than 30 varieties) and set the trend for marrying fine chocolates with coffee. Harold Alexander is still remembered as one of the most dynamic and creative chocolatiers in the world, and he clearly passed along this passion and expertise to his kids. The company and facility remain in the heart of the West Village, where Leslye and Jeff remember going as kids to the “factory” to experiment in the candy kitchens. Today they get to make a living of it each day and have invented such innovative sweets as the Chocolate-Covered Gummi Bear." Kopper's was founded in 1937 by Fred Stern and a partner, David Kopper (1895-1962). This partnership dissolved early on. By the early 1940s David Kopper had his own separate business, manufacturing molded chocolates at 217 W. 80th St. When David Kopper registered for the World War II draft, he was employed at D. Kopper, Bonbonnière, 252 W. 72nd St. This business was described as follows in the New York Times, 29 May 1944, "Chocolates showing a good deal of originality in design are made from fine quality ingredients at 217 West Eightieth Street in the modest establishment of D. Kopper, Bonbonnière, a concern that is not to be confused with any other candy company of similar name. Its head is David Kopper, who was born in Budapest and who has had twenty-four years' experience in the confectionary trade in Europe and this country. Before coming to America about a decade ago he served as technical adviser to one of the largest and most celebrated manufacturers in Switzerland. Mr. Kopper, who asserts he is not interested in mass production at present, sells his candies through his own shops, one at 218 West Seventy-second Street (between Broadway and West End Avenue), and the other at 794 Madison Avenue, corner of Sixty-seventh Street. In addition, his chocolates may be procured at the factory on West Eightieth Street, where they are molded rather than hand-dipped." This ad for D. Kopper appeared in the Manhattan telephone directory, 1946.